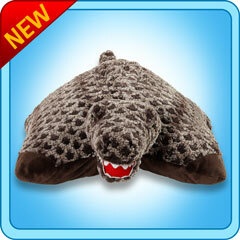 Home > PillowPets 18" > T-Rex Dinosaur 18"
My Pillow Pet T-Rex "Dinosaur" Toy - Size: large 18"
Another great addition to the My Pillow Pets product line would have to be the My Pillow Pets T-Rex. We all know this is probably the most popular dinosaur with the majority of kids, and it was fun to see My Pillow Pets create a "scary", the term used very loosely here, pillow pet instead of the traditional smiling animals. 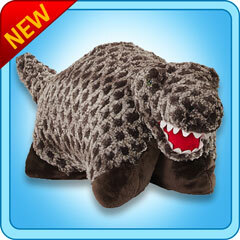 Besides, dinosaurs are a natural addition to a product line that has become so popular by creating unique stuffed animals. The T-Rex is a lot of fun because it looks great with its dark checker board color pattern, line of teeth, dark feet, and long tail. 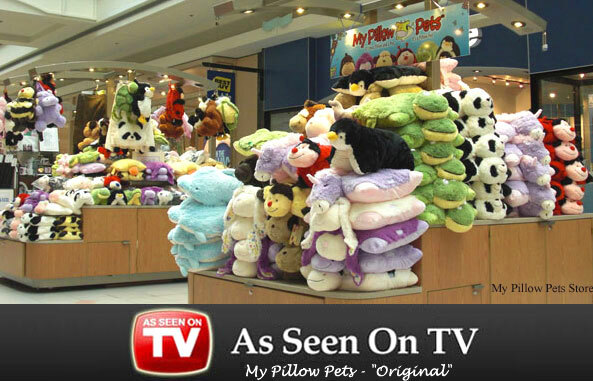 Just like all the other pillow pets it is still made from that same soft plush material that kids love, and it still has the unique ability to be both a pillow and a stuffed animal. All of these great factors guarantee this is going to be another very popular item.